The blockbuster success of Hitchcock’s Psycho inspired Castle to venture into psychological thrillers, and the filmmaker did his best to outdo that 1960 classic with this hair-trigger tale of madness, murder and a family inheritance. A dead-of-night wedding in Ventura that ends in bloodshed is just the start of the many shocks that fill this complex story, filmed in scenic Solvang. Oscar winner Hugo Friedhofer (The Best Years of Our Lives, One-Eyed Jacks) wrote the chilling score, ace noir cinematographer Burnett Guffey (The Reckless Moment, Human Desire) shot it and Castle had one of the actors billed under a pseudonym to add to the mystery. For the coup de grace, he created the “Fright Break,” which gave terrified audience members one last chance to leave the theater before the film’s startling climax. His reward for those who couldn’t muster the fortitude to stay through the end? A walk of shame along the “yellow streak” to the “Coward’s Corner,” where full admission price would be refunded while fellow patrons jeered. 1961, 87 minutes, black and white, 35mm | Produced and directed by William Castle; written by Robb White; with Glenn Corbett, Patricia Breslin, Jean Arless, Eugenie Leontovich, Alan Bunce, Richard Rust. 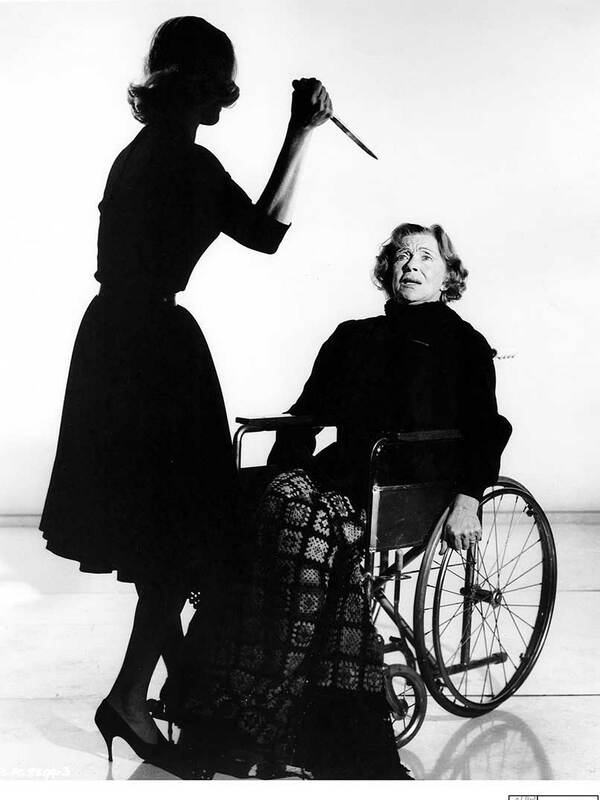 Jean Arless and Eugenie Leontovich in Homicidal, 1961.